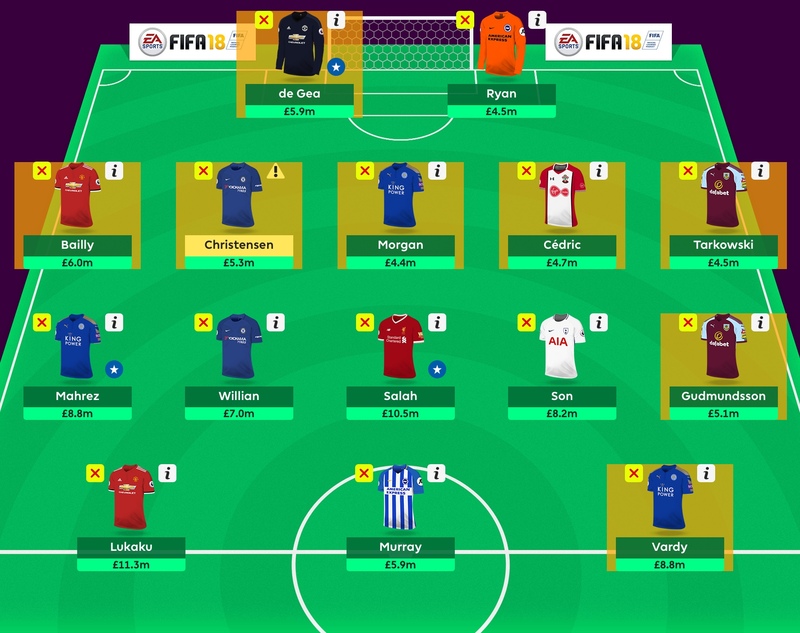 The International Break has been used wisely at Fantasy Football Community and we can now reveal the Gameweek 32 Wildcard Team! No major issues arose during the press conferences today. Christensen is a slight doubt but we never planned to start him this week. Gudmundsson was declared fit. Kane is at 25% fitness, which is too sketchy for us right now. The plan is to bring him in for DGW34 with 2FT if he is fit, in a move which ditches Son and Vardy. Watch this space. Here’s the team. We didn’t fancy Salah away to bogey team Palace, so we’ve trusted the armband with Lukaku. The Gameweeek 32 wildcard team button was activated on Saturday 17th March, before the first announcement of Double Gameweek fixtures. The fixture surprises may have swayed the strategy if the button hadn’t already been pressed, but we’re happy with how things have panned out. To note, we are at an overall rank of 300k, team value of around £101 million, with the Bench Boost and Free Hit chips still to be played. Here’s the plan. We decided that it was too much of a gamble to save the Bench Boost until Gameweek 37, as a lot can change in just a few weeks. Plenty of teams may not have a lot to play for by then. 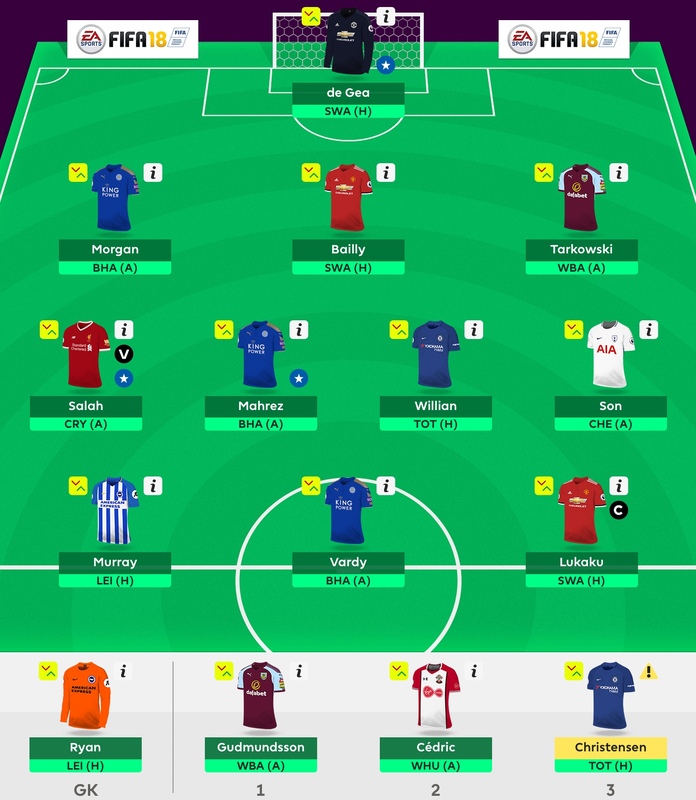 Here is the provisional Gameweek 32 wildcard team. Salah stays, despite having no double gameweek and we have two free transfers before Gameweek 34. I’ve made the decision to go without any further Liverpool cover, plus no Arsenal or Manchester City. All three of these teams are heavily involved in European games around Gameweek 32-34. Leicester have the pick of the fixtures for the Double Gameweek and the run in, so we have gone for three of their players: Mahrez, Vardy and Morgan. Maguire was a consideration in defence, but lack of funds meant that we opted for Morgan who is more than 1 million cheaper. From the top six, Chelsea and Manchester United both have good fixtures for the double gameweek. 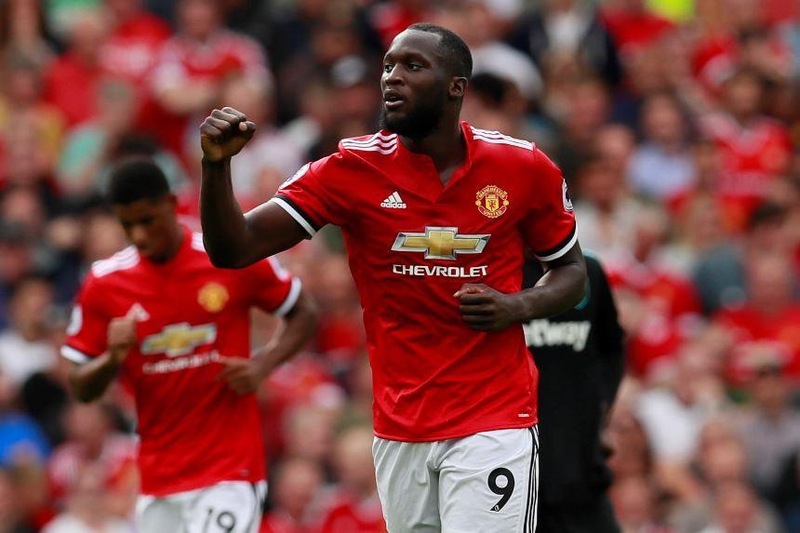 Lukaku is the standout captain option for the Double Gameweek and has a good fixture for Gameweek 32, so he was an obvious choice. In a break from the norm, we’ve invested in a premium keeper: De Gea up against West Brom and Bournemouth seems like a no brainer though. We are so confident on the United defence that we’ve gone for a double up for the run in, with Bailly coming in too. We would have loved to get Marcos Alonso in, but struggled for price yet again, so Christensen gets the nod. Hazard was too expensive and even though Willian is a risk, he’s in form. We decided that a double up from Chelsea should be sufficient. Of the rest of the teams with a double gameweek 34, Brighton and Burnley appealed the most. Spurs and Southampton are covered too, but to a lesser degree. Bournemouth players were ignored due to poor fixtures. The main debate in attack was between Gross/Barnes or Gudmunsson/Murray: we went with the latter since Gudmunsson is on set pieces, Barnes is a rotation risk and Murray has penalties. In defence, Ryan is the backup to De Gea with a kind Gameweek 33 fixture, since United travel to City for the derby. Tarkoswki is selected over Mee since he comes in cheaper and is nailed on for Burnley. Son takes the final attacking spot for Spurs, since he has good form and is relatively cheap compared to the other Spurs midfielders. We couldn’t stretch to a Spurs defender and the fixtures aren’t that great for them anyway. Cedric gets a call up to defence: we looked at Stephens but expect less rotation at Left Back. The biggest dilemma for the wildcard was the flexibility to react to bringing in Kane if he happens to be fit prior to Double Gameweek 34. Chelsea face Spurs in Gameweek 32 which is far from ideal, plus Manchester United face Manchester City in Gameweek 33. However, there’s strength on the bench for both of these weeks and it was felt that attacking assets are still likely to perform. With two free transfers, we have the option to take out Vardy and Son, for Kane and a cheap filler. If not, then the free transfers can be used to cover any rotation or injury problems that may crop up. With Free Hit in blank gameweek 35, we plan to field a strong side with players from Liverpool, Manchester City and Arsenal. The squad already comprises 12 players with a double in Gameweek 37. Transfers from DGW34 onwards will be used to build the best XI for the final double gameweek of the season. Before you go, check out the Gameweek 32 Wildcard Special to see how the rest of the community are setting up their sides. Good Luck!